Although bariatric surgery is very effective, it can seem like a very drastic step for people with less weight to lose. For people with a body mass index of between 27 and 40 kg/m² there are a number of endoscopic treatments available that do not involve surgery, but help people lose more weight than diet or exercise alone. The best established of these are intra-gastric balloons that are placed temporarily in the stomach via the mouth using a flexible endoscope. The ORBERA® intra-gastric balloon is a non-surgical, temporary device designed to boost your current weight loss efforts during the 12-month program. While it isn’t a permanent device, it allows you to learn portion control and develop healthy changes in your eating habits that can last well beyond the 6 month balloon placement. Many diet programs are difficult to maintain as you struggle with feeling hungry. 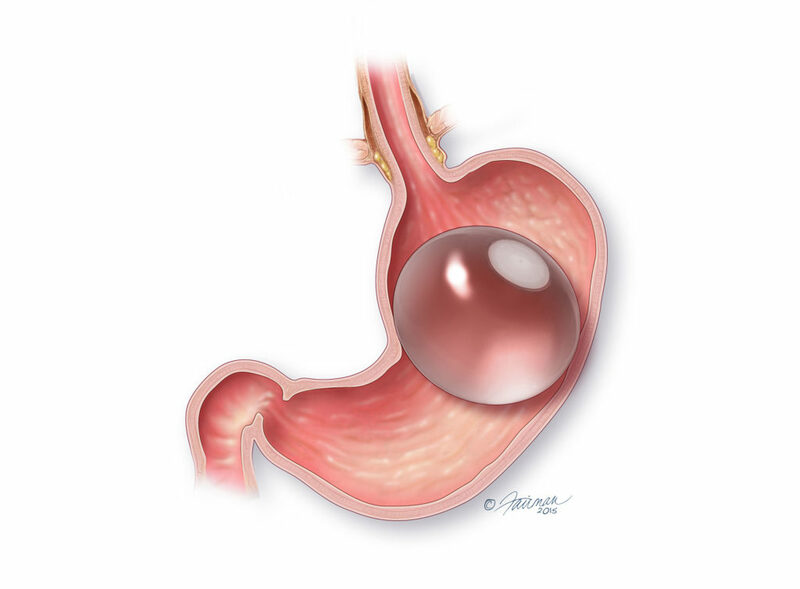 With Orbera® you eat smaller meals, because the balloon takes up space in your stomach. You are able to control your eating, learn portion control and make healthy changes in your eating habits. The comprehensive, two-part program starts with a soft, intra-gastric balloon placed in your stomach for six months to encourage portion control. The second part of the program is very important because it helps you maintain the weight loss. Our team will work with you to guide you through the process of developing a customised diet & exercise program and support you in making healthy lifestyle choices. Clinical evidence suggests people lose an average of 10-15kg in 6 months, however this is dependent on a person’s starting weight, metabolic rate and how well they adapt to the lifestyle changes. After 12 months with the ORBERA® two-part program, patients lost on average over 3 times the weight of diet and exercise alone. The insertion procedure is performed via gastroscopy under light sedation, during which the Orbera® balloon is inserted into your stomach via your mouth, and usually takes around 20 minutes. The deflated balloon is inserted into your stomach through your mouth and then filled with sterile salt water. After you regain complete awareness you remain in the hospital for observation for several hours before discharge home. After 6 months, the intra-gastric balloon is removed and your support team will continue to guide you toward making healthy lifestyle choices. The ORBERA® balloon is removed through the mouth in a similar manner to it’s insertion, under the same supervised conditions. The ORBERA® balloon has been evaluated in over 230 global clinical studies with studies showing an average weight loss of 10-15kg in the 6-month time frame. There has been over 220,000 procedures performed worldwide across 20 years, and with ORBERA®, 70 to 80 percent of the weight loss typically occurs during the first three months of treatment, so having a team of experts to help you overcome the challenges of retraining your appetite, adopt new nutritional habits, and establishing a reasonable exercise routine is essential to meet your long-term weight loss goals. The ORBERA® balloon works by filling the stomach to reduce hunger, so one of the most common side effects is a feeling of nausea. This typically is worse immediately after the insertion procedure and gradually subsides after that. A small number of people do not tolerate the balloon and need it removed because of persisting severe nausea. There are also small risks of the balloon causing ulcers in the stomach, and of unexpected balloon deflation which can lead to blockage of the intestine. ORBERA® is indicated for those with a BMI of 27 and above. For further information please visit the ORBERA Youtube channel.